Site news | Site map | About this site | About the author | Testimonials | ADVERTISE! | Mailbox | DONATE! On July 14, 1968, unknown to the world, disaster struck on the launch pad in Tyuratam, resulting in the death of one person and injury to another. 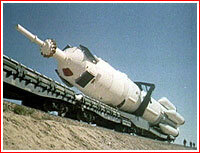 The accident prevented the 7th Soviet attempt to launch an unpiloted version of the circumlunar L1 vehicle (later known as Zond) and was followed with a harrowing recovery operation on the launch pad. Service gantry approaches the UR-500K-L1 vehicle on the launch pad. Ironically, according to plans in place between around April and August 1967, Vehicle L1 No. 8L could be the first of at least three spacecraft to carry pairs of cosmonauts behind the Moon as early as the end of 1967 or the beginning of 1968. (774) Obviously, it was not to be the case, because the previous flights within the L1 program revealed numerous problems with the spacecraft itself and its UR-500K rocket. As of March 1968, the launch of the L1 No. 8L vehicle was re-scheduled to a period between June and August 1968 and it was now meant to be an unmanned test flight. The flight program included a loop behind the Moon and landing back on Earth. On Saturday, July 13, the State Commission chaired by Lt. General A.G. Mrykin gathered at Site 92 in Tyuratam and cleared Vehicle No. 8L for the rollout to the launch pad. The head of the TsKBEM design bureau Vasily Mishin, leading the L1 project, said the final word at the meeting. The transfer of the UR-500 rocket with the L1 No. 8 spacecraft began traditionally at 7:00 in the morning on July 14, 1968. By 8:30 in the morning, the vehicle arrived at the "Left" launch pad at Site 81 and the pad personnel began erecting the rocket in the vertical position. 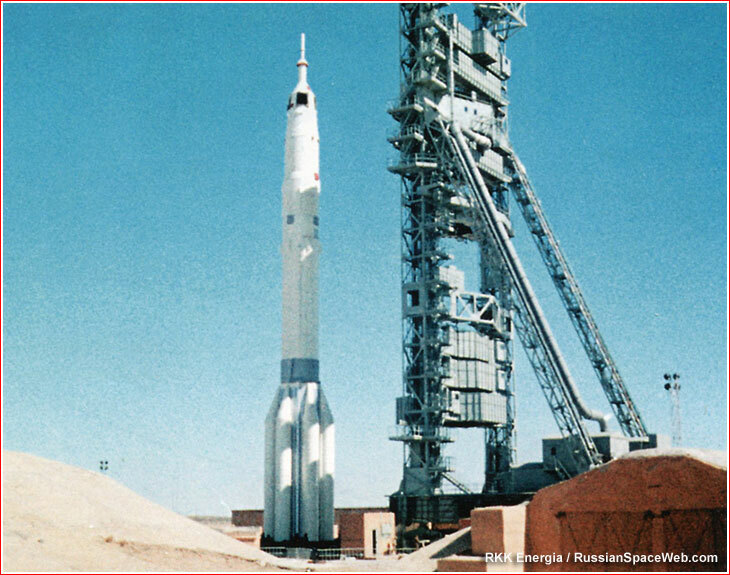 The 8T185 service gantry was then rolled onto the pad and its access bridges were folded around the rocket. Officers from the 4th Test Directorate, 4 NIU, responsible for testing of the UR-500 series, began the seemingly routine processing of their 10th flight-worthy vehicle. At 10:20 in the morning, around 150 members of the launch personnel were working at various levels of the gantry and on the launch pad, when a sudden blast shook the facility. At that moment, a senior test officer Ivan Evteev was on the bottom level of the service gantry about to get into the elevator for a ride upstairs. He remembered a loud bang, followed by the dull sound of the vehicle hitting the gantry, and then, a deafening squeaking of scratching metal. Numerous flying shards of metal were loudly colliding with the metal structure of the tower and torn fragments of thermal insulation were raining down to the ground. Immediately, Evteev heard the rumbling of multiple feet of soldiers and officers running down the stairs. Among them, he recognized a military engineer Captain L. N. Ivanchenko, who seemed to be fine, but followed by a conscript soldier with a bloodied hand. In just a few moments, the service structure was completely deserted and an eerie silence descended over the facility, backdropped by flakes of insulation still floating to the ground. From the outside, the lucky escapees saw huge twisted pieces of metal hanging from the service gantry around Level 7. The tilted body of the L1 spacecraft was visibly leaning against the gantry. It quickly became clear that the upper composite, including the L1 spacecraft had been completely severed by the blast from the rest of the rocket near the Block D upper stage. The estimated 20-ton section of the spacecraft was now hanging precariously inside the gantry and could seemingly collapse further down at any moment. 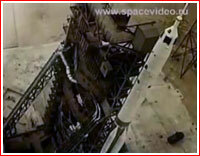 If it smashed into the pressurized tanks of the UR-500K rocket below, a much bigger explosion could follow. Sometime after the accident, top officials arrived at the pad. 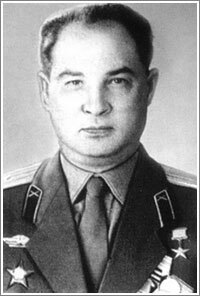 The group included Mishin, and his deputy for testing Evgeny Shabarov, Major General A. M. Voytenko, Acting Chief of the Test Range; Major General Anatoly Kirillov Deputy for Space; Vladimir S. Patrushev, Chief of the 1st Test Directorate and his deputy Vladimir Bululukov. Although, there had been no fire or propellant explosion on the pad, the payload fairing of the L1 spacecraft had been ripped apart by the ruptured oxygen tank of the Block D stage. The entire upper composite had slipped down by several meters and was stuck inside the service gantry, supported by the access bridges. In the meantime, the largely undamaged fuel tank of the Block D, with small ullage thruster pods, was disconnected from the structural truss and now rested on the third stage of the UR-500K rocket, whose tanks remained under pressure but, fortunately, without propellant. The first and second stages were also empty. At the time of the accident, the fuel tank of the Block D contained five tons of kerosene and a total of 1.5 tons of highly toxic hypergolic propellant was inside the URMD SOZ ullage motors of the Block D and in the tanks of the KDU propulsion system on the L1 spacecraft. In addition, 1.5 tons of solid propellant was contained in the Emergency Escape Rocket, SAS, and another 25 kilograms of explosives were in the APO self-destruct mechanism aboard the Descent Module of the L1. To complicate matters further, 30 kilograms of highly concentrated hydrogen peroxide was located in the Descent Control System, SUS, of the Descent Module and in the tanks of the DO attitude control thrusters in the Instrument and Aggregate Module of the L1 spacecraft. Furthermore, Block D contained 4.5 liters of trimethylaluminum used in the Multiple Ignition Unit, BMZ, of its main engine. Last but not least, the thermal control system aboard the L1 spacecraft was filled with highly flammable gasoline-based coolant and more than 150 pyrotechnic charges were live-wired to the power supply system. The pair of spring-loaded solar panels on the L1 spacecraft were armed and under electric current. As usual under such circumstances, the personnel involved in the accident faced potential accusations of negligence or even sabotage. Evteev and his rank-and-file subordinates, who were actually performing on-pad processing of the L1 spacecraft, quickly found themselves at the center of an inquiry by security services. At the same time, the top officials were not immediately available, leaving mid-level officers to face rather serious accusations. Right before the rollout of Vehicle No. 8, the head of launch operations Anatoly Mogila had delegated his responsibilities to his deputy Trashenkov. In turn, Evteev was filling in for his boss Yu. N. Gorbunov, who was on a summer holiday. Even more ironically, Colonel V.A. Nikolaenok, the head of the 4th Test Directorate, responsible for testing of the UR-500K rocket, also skipped the rollout for a management meeting at Site 10. As the blame game was brewing, Voytenko invited Evteev to his office for a detailed account of the accident, but they were soon interrupted by a telephone call from Moscow. 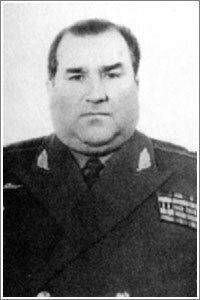 Marshall Krylov, the Commander of the Strategic Missile Forces, RVSN, was at the other end of the line, demanding to know who had overruled his previous order not to conduct launch operations on weekends! Voytenko responded that he was not the one who had allowed the rollout on Sunday, even though, as Evteev noted, Voytenko had signed off on the move as one of the members of the State Commission. But Voytenko preferred to shift the blame to General Mrykin who had chaired the fateful meeting. The next day, Marshall Krylov and Deputy Minister Tyulin arrived at the launch pad and inspected the rocket from a distance of 100 meters. The group then headed to Facility No. 132 for another feisty technical discussion. TsKBEM specialists discuss a crisis on the launch pad (left to right): Yuri Semenov, A.P. Sobko, Yu. I. Lygin, V.I. Mytarev, N. D. Bondarenko, V.A. 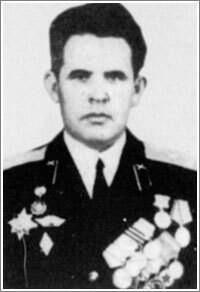 Bobkov. According to the emerging picture of the accident, stray electricity in the defective cabling network apparently triggered a faulty command to pressurize the oxygen tank in the Block D, eventually causing it to burst. 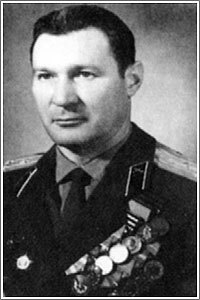 Colonel V. A. Nikolaenok, head of the 4th Test Directorate, formed a team of electric engineers to look into that scenario. The State Commission now chaired by the Minister of the General Machine Building Sergei Afanasiev, ordered an attempt to salvage the remnants of the vehicle and try to preserve the launch pad from serious damage. Afanasiev's deputy Tyulin took charge for planning the potential operation. 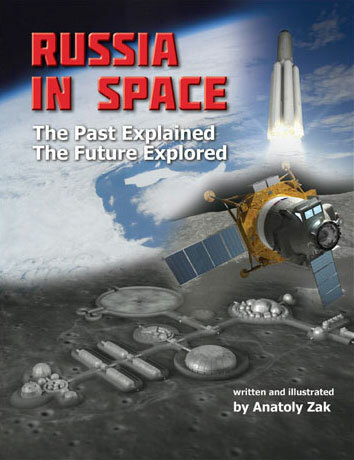 (664) Vasily Mishin supervised the work in respect to the spacecraft and Yu. 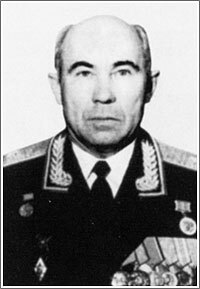 N. Trufanov, a leading engineer on the UR-500K rocket, oversaw the rocket removal process. V.A. Nikolaenok and A.S. Kirillov coordinated the interaction of the salvage team with the range services. According to Kamanin's notes made as late as July 17, there was an idea to use Mi-6 or V-10 heavy helicopters to extract the damaged spacecraft from the service tower. However in addition to the great danger to the helicopter crews trying to pull up what would be essentially a ticking bomb, the mass of the cargo to be lifted was estimated at 14 tons, while the helicopters' lifting capacity was limited to 8 or 10 tons. Therefore, splitting the spacecraft into multiple sections would be required first. Still, Kamanin arranged with the Deputy Minister of the Aviation Industry V. A. Kazakov to immediately dispatch the crew of the V-10 helicopter led by chief pilot B. V. Zemskov to Tyuratam, so the pilots could assess the situation for the themselves. (820) Ultimately, the idea of using the helicopter was dropped. Instead, Tyulin called a Moscow-based organization called Stalkonstruktsiya (or Steel Construction), whose highly trained workers specialized in assembling high-rise structures, including the giant Ostankinskaya Tower in Moscow, the highest building in the USSR. 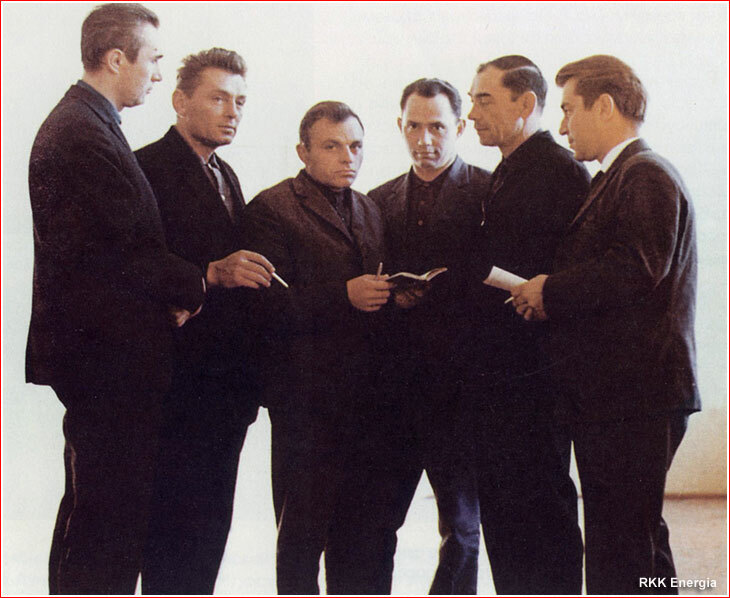 (664) The company dispatched a brigade of experienced industrial climbers led by V. A. Frantsuzov. (52) They inspected the pad and helped to draft a plan to extract the dangerous wreckage. A special cable drum driven by two electric motors was installed around 350 or 400 meters from the pad behind a fortified fence and was wired to a power generator of the launch facility. The electric motor was to be connected to a special beam with a pulley mechanism, which would be mounted at the top of the service gantry. Before attempting to lift the vehicle, it was necessary to slice the mangled payload fairing into pieces and, if possible, to drain the maximum amount of flammable propellants, as well as unplug pyrotechnic charges and remove the emergency escape rocket. Engineers from TsKBEM, Nikolai Zelenshikov, V.I. 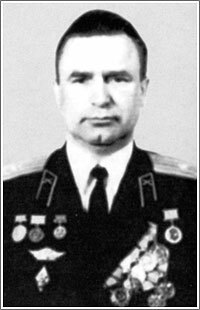 Gavrilov and Valery Ryumin (the future cosmonaut) were responsible for disconnecting the pyrotechnics and solar panels from the batteries and disengaging the emergency escape rocket. A brigade from the ZEM experimental plant in Podlipki, which built serial hardware for TsKBEM, was given the most dangerous responsibility of cutting the payload fairing, removing solar panels and disconnecting those pyrotechnic devices that were reachable. Only then, could the propellant drainage operation be attempted. The ZEM team included Yu. I. Lygin, M.I. Lomakin and V.P. Lameshin. During the cutting operation, a loose metal chard propelled by a gust of wind seriously injured Lameshin, but other members of the team successfully deactivated the most dangerous systems of the vehicle. Then, five tons of kerosene were carefully drained into a pre-positioned cistern. Hydrogen peroxide from SUS and DO systems was also successfully drained and the tanks of the URMD SOZ system were removed without an accident. The BMZ Multiple Ignition Unit with trimethylaluminum was removed next, but only a portion of the coolant fluid from the thermal control system could be drained. Unfortunately, the draining of the toxic propellant from the KDU propulsion system proved to be completely impossible. Remarkably, the super delicate and dangerous operation went without a hitch. Although the faulty connection was the result of the manufacturing defect in the cable, it was not caught during ground tests. The deadly explosion took place on the launch pad after a command from the test manager via an intercom system of the launch facility directing the processing personnel to inspect the vehicle. As a result, by the time of the accident, specialists led by Ivan Khridin were already deployed at Level 7 to check on the Block D. Khridin was conducting an inspection of avionics inside the Block D stage through an open hatch, when the blast ripped apart its structure. Khridin was struck with metal debris and died of head injuries. Obviously, there was not a word about the accident in the open Russian sources until the dissolution of the Soviet Union, even though the US intelligence services apparently quickly learned at least the basic facts of what had happened. As it turned out, at some point in the development of Block D, engineers at TsKBEM introduced a safety cover to be installed on the Drainage Safety Valve, DPK, of the oxygen tank. Made from the material 10 times stronger than the walls of the tank itself, the cover was intended to prevent accidental depressurization through the drainage valve and the subsequent collapse of the thin-walled tank during the transfer of the stage from the assembly building to the launch pad along with the rest of the rocket without any external source of pressurization. However the developers failed to notice that once the UR-500K rocket is installed on the launch pad in vertical position, a special interface plate at the bottom of the rocket automatically re-connects the vehicle to various ground systems of the launch pad, including the nitrogen pressurization line. The ground equipment then pumps nitrogen into the system as necessary, while the DPK drainage valve on the tank can always reduce any excessive pressure... That is, of course, if the DPK valve itself is not plugged by the safety cover, which is supposed to be removed by the pad personnel! However, the specialists can reach the tank only after the arrival of the service gantry and the deployment of access bridges, which obviously happens sometime after the rocket has already been in vertical position and connected to ground supply systems. Mishin's Deputy Shabarov, responsible for testing, and test specialists in Tyuratam all failed to anticipate this potentially deadly issue. According to that account, after the accident, Mishin, Vladimir Barmin (launch systems developer) and Nikolaenok were looking for an explanation of the accident, which would not implicate the design. Conveniently, they were informed that during testing of the launch equipment with a mockup vehicle, either the whole prototype of the rocket or its Block D stage was not available. As a result, electric tests of the cable, which controlled the pressurization in Block D, could not be performed. After the accident, the cable was tested and was found to be susceptible to stray current. According to the skeptics, Mishin and others used that problem as a convenient decoy to refocus the investigation on the manufacturing defects and they were not interested in looking beyond that. In reality, TsKBEM's faulty design was the primary culprit and the inadequate oversight by test specialists at the 4th Test Directorate was the main contributing factor, according to that account. A rollout of the UR-500K-L1 vehicle to the launch pad. The service gantry approaches the UR-500K-L1 vehicle.